Welcome to our wonderful oceanfront villa conveniently located on the Isle of Palms. This sunny and spacious 4 bedroom, 3 bath condo is located on the corner of the building. Major upgrades have just been completed for summer of 2018! Freshly painted throughout, including walls, doors, trim, baseboards, granite counter tops throughout kitchen and baths, new sinks and faucets in kitchen and all baths, stainless steel appliances, gorgeous driftwood tile, leather reclining couch and love seat, huge 70" TV with tons of channels, chandelier, ceiling fans, crown molding, large walk in master bath shower, new queen size sleeper sofa in master bedroom, new TV console, outdoor balcony conversational seating and more. Fresh new bedding, linens and towels. New carpet just installed in June in every bedroom. The kitchen has new granite counter tops and back splash, breakfast bar with seating for 4, new pendant lighting, and overhead lighting, stainless steel refrigerator and freezer, pantry, stainless steel microwave, stainless steel dishwasher, stainless steel glass top cook stove and oven, large deep under mount sink with large new faucet, and garbage disposal. This kitchen is fully equipped for cooking and entertaining. The kitchen overlooks a spacious dining area with new dining furniture including a large table with seating for 8. There is a large buffet and brand new brushed nickel chandelier. The living area has a large 70" TV, tons of cable channels, movies on demand including a ROKU system that offers Netflix, Hulu, Crackle, Popcorn, and other various movie options for your viewing enjoyment. There is a new TV console. Leather reclining couch and love seat, and two side chairs round out the living area, with sliding doors leading to the oceanfront balcony. The master bedroom is oceanfront and has a king bed, entertainment center/dresser with TV, new queen size sleeper sofa, walk in closet, and sliding doors to oceanfront balcony. The master bath has new granite counter tops with double under mount sinks, new faucets, new tiled over sized walk in shower, frame less glass door, and detachable variable speed hand held shower head, There is a new comfort height toilet and new tile floors. The large oceanfront covered balcony boasts a wicker seating area including love seat, coffee table, and two swivel chairs. There is an additional round table with 4 chairs, 4 bar stools, and a large cooler. The second bedroom has a queen bed, its own TV, dresser, closet and access to another bath. The bath has new granite counter top and under mount sink, linen closet, and a new comfort height toilet. The third bedroom has a queen bed, its own huge TV, dresser, closet, and shares a bathroom with new granite counter tops and under mount sink, with the fourth bedroom which has two twin beds, dresser, Roku streaming TV and closet. There are games, stuffed animals, DVDs in the closet. Every bedroom has lots of windows since the condo is on the corner of the building. There is a laundry with brand new full size washer and dryer, iron, ironing board, tons of pool and sand toys, floats, boogie boards, skim boards, and more. The resort has a private swimming pool which is oceanfront, brand new furniture, grilling area, and a covered parking garage. There is elevator access. The resort area has wonderful restaurants and shopping all within walking distance. Park your vehicle and walk to everything! The surrounding area boasts more shopping, movies, fun park, and historic Charleston is only minutes away. Enjoy the beach, watch dolphins play, eat and relax on the spacious oceanfront balcony. 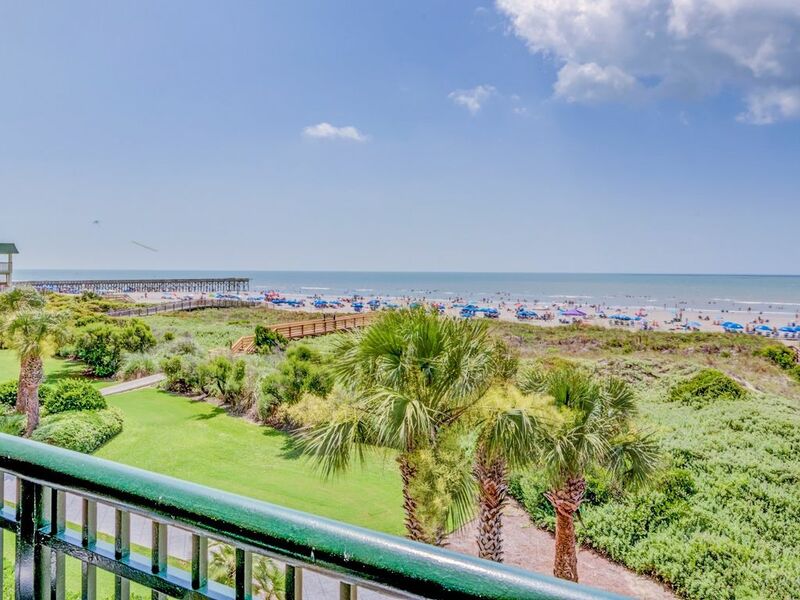 Rest, relax, and have fun with family and friends in this wonderful oceanfront condo. Best wishes for a pleasant stay! Book early for best selection - we only rent for 10 weeks out of the summer. We purchased this condo because it is directly on the beach within walking distance to many shops, restaurants, and grocery stores and it is close to our home so we can be there in a few minutes. It is very relaxing, enjoyable and fun to share with our family and friends. Of course the direct oceanfront view and access is perfect. We love the convenience of walking to many of our favorite restaurants. We can walk to shops and grocery stores. We love the floor plan because the main bedroom is set apart from the other three bedrooms and it is great for sharing with family and friends. It is easy to entertain and it is sunny and spacious because it is on the corner of the building. We enjoy the close proximity to Charleston and it's historic area, market area, and restaurants. We love the shaded balcony where we can watch the sunrise, dolphins, kites, and enjoy our drinks and meals oceanfront! We can cook with the fully stocked kitchen or order out. 3 full baths all UPGRADED with granite counter tops, under mount sinks, new faucets, new comfort height toilets: Main bath with double sinks, new over sized walk in shower, hand held shower head, frame less glass door, new tile throughout; Second and third baths with new granite, new under mount sink, new faucet, new toilet, new tile throughout and shared access. I cannot say enough good things about this place. We were ready to re-book before we left. Three families shared this condo, and it did not feel crowded. Walking in, the first thing that you notice is that it is indeed well cleaned. No sand or grit on the tile floors and everything was in place and ready. The upgrades to this place, like granite and lighted faucets, make it feel luxurious. The balcony has two separate, full size, sitting areas which makes it very comfortable. The Kitchen was stocked with all the cooking and grill needs all the way down to little things like clips for chip bags (which no one ever brings with them). The pool is well maintained and the beach access is very convenient. The music described in many posts, was present, but was normally acoustic guitar and was done by 10-10:30pm. The beach was more crowded than we expected probably due to the community park access being close. The villa is completely updated and very nice. Newly renovated condo had everything you could possibly want.....gorgeous view, convenient location, covered parking, new furnishings and kitchen/baths. Debby thought of so many little details like ziplock bags, tinfoil, coffee filters and even a pot of fresh herbs on the porch. We parked our extra car across the street for $12/day but Debby offered that we could park at her office for free. The public beach access is close by so the beach was quite crowded on Sunday, but we easily found a spot. We rented 2 chairs and an umbrella for the week ($150/week) from the local company that has the blue umbrellas all up and down the beach. This helped us always know we had a prime spot on the beach. It was much less crowded during the week. Grocery store and wonderful seafood market close by. Live music from the bar next door was like having a private concert on the deck. They stopped playing by 10 so it was not an issue at night. Hope to return again soon! Beautifully laid out condo. Impeccably decorated and furnished. Amazing ocean views. Everything we could have possibly needed was there. Would 100% recommend this property. The condo is very nice and well equipped. The beach has public access on both sides and gets crowded. I would suggest a informational email a week prior to arrival with gate codes, exit instructions, and general information. Beach was 3 star due to public access. Historic Downtown Charleston with loads of history and museums, carriage rides, restaurants, shopping and more!